"I've worked with other orthodontists in the area and I'm really happy with Dr. Powell and his staff. I almost look forward to my next visit. I don't do pain well...and they know it and do everything possible to reduce my discomfort." "My experience with Dr. Powell and his staff has been wonderful. As an adult, I was a little apprehensive about orthodontic treatments. Dr. Powell and his staff put me at ease with their service and complete explanation on what to expect. The staff has always been very kind and showed great respect. I would recommend family members, friends, co-workers and others to seek orthodontic treatment from Dr. Powell and his staff." "I work in a medical office, so I know the work involved in caring for patients! I have NEVER been to any business that was run by such pleasant and efficient staff and doctor! My experience could not have been better. Everyone explains each step very clearly, and makes the experience less stressful. My eight year old son is going through this as well and they have been wonderful at making him comfortable. Thanks to each and every one of the staff!" "I'm always impressed when I walk in Dr. Powell's office; everyone there is so friendly and genuinely concerned about your welfare. When I walk in I see ‘Love in Action’. The passion they have for what they do is extraordinary and it shows at the highest level. Truly an example of Love." "Dr. Powell and his staff are one of the best orthodontists in the Evans area. He and his staff have been taking care of my family's ortho care for the past 3 years and I would recommend him to anyone! My daughter will get her braces off in about 2-3 months. This experience has made her feel much better about her appearance. Looking forward to the extended care when she has her retainers. Thank you Dr. Powell and staff for you commitment to your patients and their care." "Dr. Powell and his staff were beyond great at every appt. I always looked forward to seeing them. Dr. Powell is genius, he did a wonderful job at getting my smile the way I wanted it. His staff was always friendly and did a wonderful job as well. I highly recommend his services that he provides!" "From the moment we walked in the front door for our initial exam we have always had great experiences with Dr. Powell's office and staff. 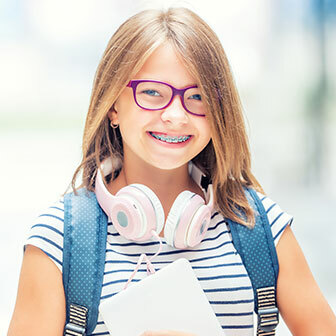 If there was ever an issue with our children's braces the office always ensured we received prompt attention and gave us timely appointments. Both of our kids who received full sets of braces over the last 2 years have gorgeous smiles now!!" "I have really appreciated the way that my family has been treated in Dr. Powell's care. Everything moves along very nicely. The office staff is very helpful and pleasant to work with. My children are always very comfortable going in for their treatments. Thank You Dr. Powell and Staff for great smiles!" "Dr. Powell's office is full of smiling faces and helpful information. I felt that Dr. Powell took the time needed to explain treatment and make the kids at ease with the procedures. I look forward to spending the next 2 years with them! :)"
"We are very pleased with the Dr. and all staff. Happy we were able to find you..."
"All staff and doctor treated my child with respect and concern! I appreciate everyone treating her so well-- of course they were just as nice to the rest of our family!! The kind and caring atmosphere will make each appt. fun and pleasurable for all!!" "We have only been to Dr. Powell's office twice, and both times we were treated SO friendly! The wait time in the waiting room was almost nonexistent, as well as the wait time in the examination room! We were in & out of there in 10 minutes tops! Great staff! So far, I've been extremely impressed with everyone there!" "I highly recommend Dr. Powell and his staff. They were very helpful in explaining recommended treatment. All around patient service was outstanding to say the least!!"